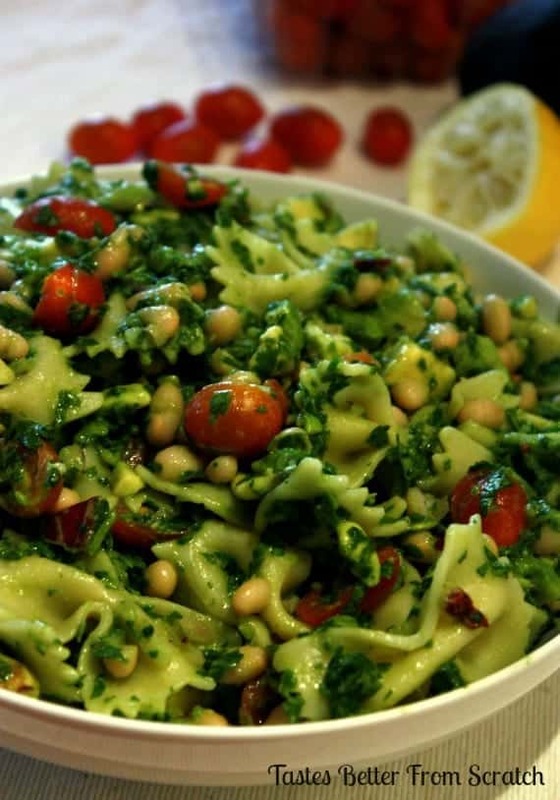 Spinach, cilantro, avocado pasta salad is the perfect way to sneak some healthy greens into a yummy dinner that everyone will eat! 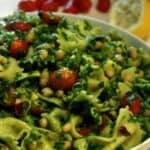 This salad is so healthy and the perfect way to get your family to eat their “greens” in a delicious way! You get your protein from the beans, healthy fats from the avocados, and there is plenty of veggies. Then top it off with a light lemon dressing and you have the perfect blend of yummy flavors! I like to make a big batch for my fridge so I can snack on this salad all week long! Bring a large pot of water to a boil. Cook pasta until done, about 7-9 minutes. Drain pasta and set aside. Add greens to a medium bowl. Add the garlic, onion, tomatoes, avocado, and beans. Toss in cooked pasta, and stir until combined. Pour dressing over the top and fold into salad until well coated. Refrigerate for at least 10-15 minutes to let flavors combine. Pinning this! Thanks to you and Craft-o-Maniac! This looks so yummy!! I’m going to have to try this! Thanks Kaysi, hope you like it! I am adding the ingredients to my shopping list right NOW. I do not want to forget about this recipe – it looks amazing!